A funny slice of a long-gone era from a time when music dominated our airwaves. Gunning for Hits #4 is populated by an amusing variety of characters, who feel real and are given time and space to grow. An amusing story with heaps of potential. The final recording sessions for Brian Slade’s new album approach their zenith, while Mr. Fixit Martin burns the candle at both ends, jetting across America and around the world to ensure the latest single becomes the smash hit he thinks it deserves to be – does it? 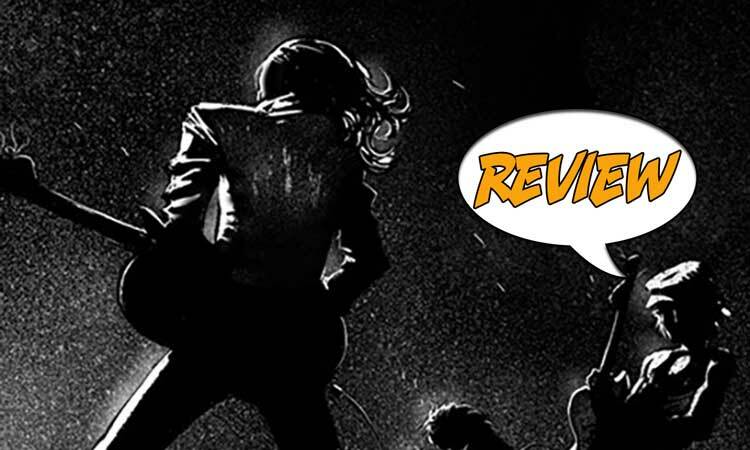 Find out in our Major Spoilers review of Gunning for Hits #4! Previously in Gunning for Hits: Brian Slade (think David Bowie) is ensconced in New York’s West Village, putting the final touches to a new studio album. Martin Mills, mobster and music hitmaker, is determined that it will be finished on time and budget. Meanwhile, the single for his new signing, Stunted Growth, is roaring up the charts and only needs a little nudge (i.e. some gunplay) to crack the huge West Coast market. But will Martin bring home the bacon, or will Brian Slade corrupt the lead singer, Billy, from Stunted Growth? When I paged through Gunning for Hits #4 for the first time, I was a little unsure whether the mix was right. We have a mobster (Martin Mills) turned hitmaker riding herd over one of the biggest acts in the world, Brian Slade, while at the same time employing criminal tactics (standing over radio execs, faking attempted hits). So that’s the serious stuff. Couple that with the slightly cartoonish artwork from Moritat, and I was left feeling a little confused. A proper read through cured me of my confusion and left me eager for more. 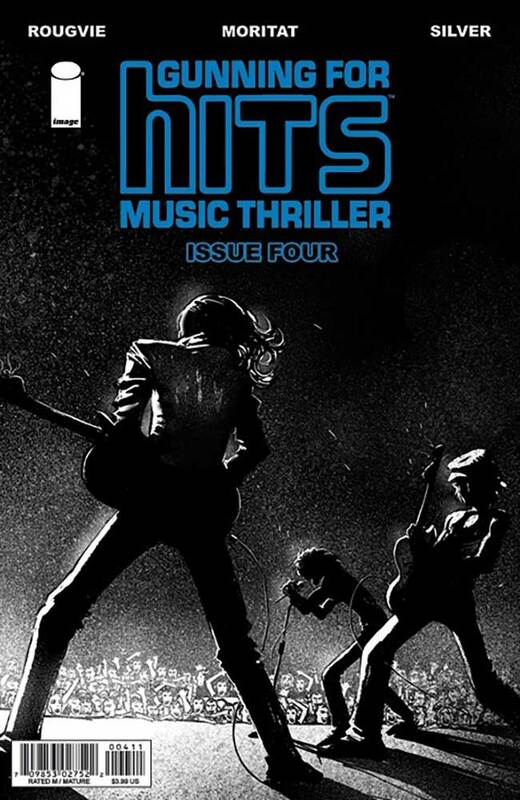 More than anything, Gunning for Hits #4 is a satire on the music industry, a gentle two-fingered salute to its excesses and its bravado. I really enjoyed it. Brian Slade is David Bowie in look, style and music tastes. He’s also portrayed here as a bit of a talent vampire, eager to soak up the eagerness of Billy, the lead singer of Stunted Growth. There’s an amusing sequence where Slade urges Billy to delve deep into his personal suffering, to fuel his music. While their managers argue in the background, Slade drops bon mots about the lack of original ideas in the industry, while eyeing off a bagful of Billy’s home recordings in the hope of snagging an original idea for himself. Meanwhile, Martin flies to Japan to broker a deal, then busts into a prime alternative radio station during a meeting, to urge the programme-makers to spin Stunted Growth’s new single. This leaves us with the highlight of Gunning for Hits #4, as the station managers are left to question whether they are cool anymore while dropping the names of bands like U2 and REM to see if their coolness is still measurable. Jeff Rougvie’s writing neatly balances all the characters, giving them all their time in the sun. The issue is dialogue heavy, but it is all presented with such a light touch that you never feel like you’re drowning in verbiage. Martin is at the centre of all the action, allowing different elements of the story to cohere around him. With the story set in the mid-1980s, there was no doubt the opportunity to create a character heavily influenced by the excesses of the era. It’s to Rougvie’s credit that Martin Mills is more an opportunist on the make, than a coke-addled maniac. That’s a role for the musicians to play. And while I had an initial concern about the art, on reflection, Moritat’s style reflects the fairy-tale world these characters inhabit. After all, what, other than sound, is being made here? True, it’s tuneful sound, but when you get down to it, it’s all a bit ephemeral, as much of the 80s proved to be. I really enjoyed Gunning for Hits #4. Martin Mills is a resourceful character racing around balancing different elements of his life in pursuit of a sure-fire hit. While admittedly he has criminal connections, and is happy to use them, by no means is he the craziest character in the issue. That’s reserved for the musicians, the hangers on, the wannabees and their acolytes who parade through the issue arguing over the minutiae of the industry, when all we really want them to do is rock! I’d suggest as Stunted Growth climbs the charts, so will this excellent slice of storytelling.